Thanks to modern technologies, fitting out the space on a boat has never been easier, making it possible to create ever more hospitable rooms. On-board galleys are very important, as they must guarantee maximum functionality but also fit in with the appearance of the yacht itself. Despite the large areas available on a super-yacht, the Roman company S.E.B. distributes on-board galleys that can adapt to numerous requisites, to offer an effective answer to specific requirements, ensuring a valid result from both a functional and architectonic point of view. Some of the products imported and distributed by the company are just right for the needs imposed by the cruising lifestyle for which super-yachts are designed. Among the many articles in the catalogue we find a waste compactor and lift-up hob tops, accessories with practicality as their strong point. The former because it permits a large amount of waste to be stored, necessary on long trips without stopovers. The latter, on the other hand, means that indispensable elements can be included in the galley without stealing worktop space. The waste compactor distributed is a good-looking accessory, with a modern, well-finished design. Furthermore, thanks to its compact size, it can quite happily be inserted without taking up precious room. The compactor and in particular model 1055, has a double-arm piston able to release 1,900 kg of compacting power, permitting the equivalent of 780 litres of volume to be compressed into a normal plastic bag. It weighs just 47 kg, has an internal volume of 40 litres and works on 220 V. The lift-up tops offer considerable advantages as there is no need for holes to set them into the tops and they can be installed over existing worktops. Their mechanism means they can be kept in the vertical position, firmly held in place by a locking lever and the worktop underneath can be used normally. 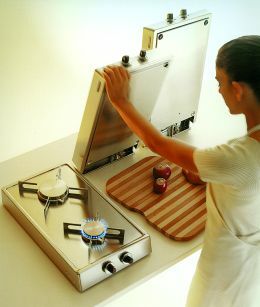 In this way there is no need for another work table or bulky island for preparation of lunches and dinners, with everything being prepared on the one practical unit. S.E.B. via della Maglianella 86; 00166 Roma; tel. +39 06 66415521; fax +39 06 66410071; website www.sebincasso.com; e mail info@sebincasso.com, sebinfo@tin.it.